Passaic County formed in 1837 out of northern part of Essex County and western part of Bergen County. Iron ore and sand-stone are found in the County. Established 1791 by a society organized by Alexander Hamilton, named in honor of Governor, afterward Justice, Paterson. Fine views of surrounding country can be obtained from Garrett Rock and Preakness Mountain near Paterson. Five miles from Paterson. Site of home of Colonel Theunis Dey, whose mansion was Washington's Headquarters from July 1 to July 29, 1780. Settled by Dutch in 1682. Site of old homesteads still occupied by Schuyler and Outwater families. Formerly noted for its iron furnaces. Ringwood Mine furnished the iron melted into cannon balls and carried by ox teams to West Point. Pompton was the site of the mutiny in 1780-81 of the Jersey Line. Quarry between Singac and Totown furnished stone for Trinity Church, New York City. 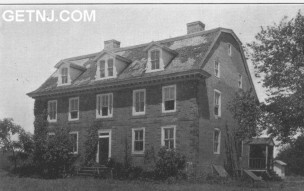 About two miles north of Little Falls at Lower Preakness on west side of highway is a two-and-a-half story stone mansion erected about 1740 by Colonel Theunis Dey, used by Washington as his headquarters in the summer and fall of 1780. Colonel Dey was commandant of Bergen County Regiment of New Jersey Militia, serving during the entire Revolution. He also represented Bergen County in New Jersey Assembly at different times between 1761 and 1783.